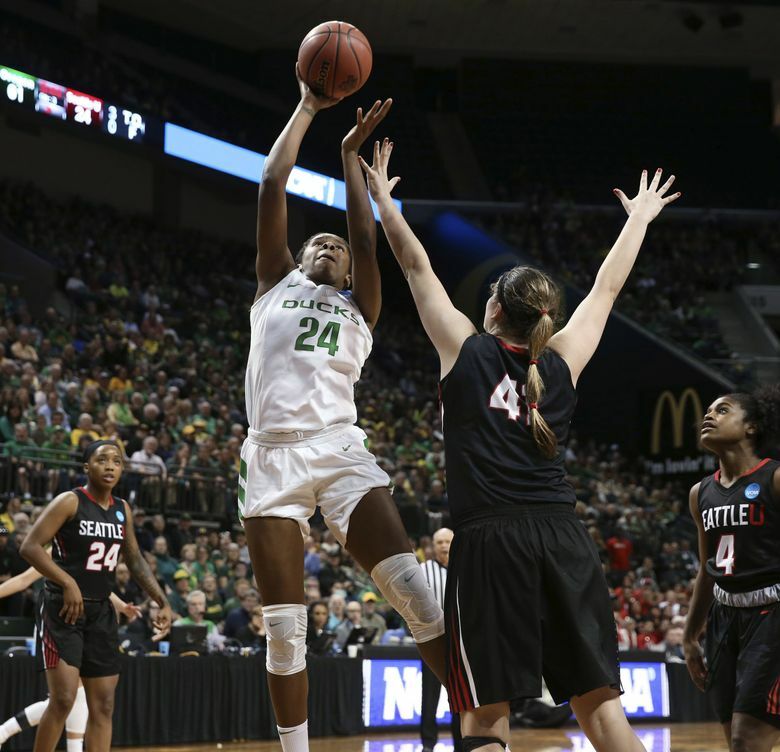 EUGENE, Ore. — Seattle U’s charmed season ended in a blowout 88-45 loss to Oregon in the first round of the women’s NCAA tournament, but they have much to look forward to. Seattle U made it to the first round of the WNIT in coach Suzy Barcomb’s first season, and built on that this year with their first ever NCAA tournament appearance. The program is on the upswing, and their goals keep growing. Oregon coach Kelly Graves, who’s in his 10th trip to the NCAA tournament, was very complimentary of his vanquished foe, in part because he has seen this arc before. Dozens of postseason wins and two Elite Eight appearances later, Graves still remembers his first tournament appearance as the Gonzaga women’s head coach in 2007 – albeit in somewhat inflated fashion. In reality, the Zags were routed 85-46 in their first-ever NCAA tournament appearance. The score is surprisingly similar to the margin Seattle U lost to Oregon by in its NCAA tournament debut, and perhaps that bodes well for the Redhawks. After turning the Gonzaga women into perennial West Coast Conference title contenders over 14 years in Spokane, Graves knows what it takes to build a program from scratch, and he believes Barcomb’s Seattle U program is on that road to sustained success. That hunger has also gripped the Redhawks. Next season, Seattle U has to replace two starters: leading scorer Alexis Montgomery and All-WAC second teamer Jacinta Beckley. But a promising nucleus of players will return, including starting guards Kamira Sanders (the Western Athletic Conference tournament MVP) and freshman McKenzi Williams, an Auburn native who played every game and was elevated to the starting lineup in the Redhawks’ final seven games. Dopplick, who started 25 games, will also be back, as will forward Kallin Spiller, Lakeside High alum who was named the 2017-18 Western Athletic Conference’s freshman of the year. At 6-foot-3, Spiller’s presence in the paint against Oregon was huge for the woefully outsized Redhawks. Seattle U was outrebounded 45-26 and had only 26 points to Oregon’s 54 in the paint. Spiller scored six of Seattle U’s 16 first half points against the Ducks Friday night at Matthew Knight Arena, and finished with 10 points, just above her 9.2 season average. The loss to Oregon showed that the Redhawks need more size on their roster if they want to compete nationally. Spiller was the biggest of Seattle U’s starting five, with 6-foot senior forward Jacinta Beckley checking in as next-tallest. Meanwhile, across the floor, Oregon had two 6-foot-4 forwards in Satou Sabally and Ruthy Hebard, and their smallest player, 5-foot-9 Lexi Bando, was taller than the Redhawks’ two smallest starters: Williams, at 5-5, and Sanders, at 5-7. “When you give up four and five inches on every single position, you have to be flawless,” Barcomb said. “And we weren’t executing on what we were trying to do. We were trying to ice Sabrina (Ionescu) and take her out of using the screen. Lack of size aside, the Redhawks will open next season as a seasoned team that’s better equipped to handle postseason play. “This is a growing experience,” Barcomb said.